Professional Schedules and Gantt Charts. 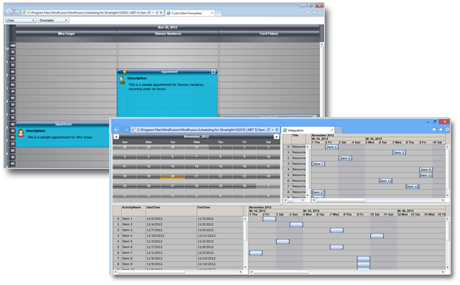 The perfect set of scheduling features is just a mouse click away from your Silverlight application. 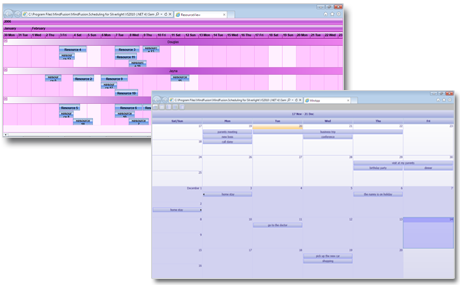 MindFusion.Scheduling for Silverlight helps you create astonishing calendars in no time at all. DateViews control is also included. With MindFusion.Scheduling for Silverlight you can display your appointments and events in a variety of formats - from the standard single week or month view to timetable or resource table. Each view supports themes and you can change dramatically the appearance of your schedule with a single mouse click. The component supports a wide range of actions that can be performed at the schedule. You can create and delete items on the run, edit data and select one or more items. The control supports automatic scrolling and navigating between dates in all views. The items of the schedule use templates and you can customize them fast and easy. The schedule uses style-based appearance and you can set every font, color, effect and text alignment that is used. The control offers a collection of predefined themes. You can create unlimited number of tasks and arrange them in a hierarchy, modify or delete them. Tasks can have dependences among them that represent the sequence in which they must be executed. DataViews for Silverlight also supports defining of resources. All operations are undoable, redo functionality is supported too.